First, let me be clear that I have no formal training in anthropology, archaeology, or Mesoamerican studies. I am simply a layperson who became intrigued enough by the ancient Maya to take the time to obtain a certain level of background information regarding that culture in specific, and Mesoamerica in general. I do have a masters degree, but not in this field. I do not intend any reader to simply take my word for any of the assertions I make, which is why I refer so heavily to the texts I have read. Those texts were written by the true experts. My intent is not to present myself as an expert, but simply to refer to their findings through citations and bibliography. My interest in the topic was piqued due to past conversations with LDS believers about whether or not the Book of Mormon could reasonably be set in Mesoamerica. I realized that I did not have adequate background knowledge to make an informed judgment on that point, so began reading, starting at a basic level with Michael Coe’s The Maya. After that, I was hooked, and eventually accumulated a personal library of over 30 texts devoted either specifically to the Maya, ancient Mesoamerica, or general archaeology. I always enjoyed reading about human evolution as well as religion, and the ancient Maya combined both explorations in one fascinating study. If I could understand, even at a very basic level, such a foreign society, I reasoned, it could help me to understand the core of “what it is to be human” in finding commonalities with the ancient Maya. While there are aspects of their culture that strike modern humans as barbaric, the more I read about their religion and way of life, the more persuaded I was that they were no more barbaric than any human culture, including our own. Yes, they committed human sacrifice, which is horrific, but it was an integral part of their religion and warfare, and had the effect of minimizing the number of deaths social conflicts entail. Our modern warfare results in far higher numbers of casualties. In addition, the Maya royalty were also military leaders, at the forefront of battle, at highest risk to be captured for the purposes of ritual sacrifice. Compare this to our modern political leaders, who sit behind comfortable desks making decisions that endanger the lives of thousands without the slightest risk to self. I am certainly not justifying the Maya practice of human sacrifice, but rather trying to put their “barbarity” into perspective as compared to our own. While I spent several years obsessed with the ancient Maya and Mesoamerica, in the past year I have felt that I reached my goal of basic understanding, and have moved back towards my primary interest, human evolution in general, in particular combined with religious expression. For this reason, I intend to be somewhat restrictive in regards to how much time I will continue to invest in this personal interest. Once having obtained a certain basic understanding of the ancient Maya, I combined this with my understanding of the Book of Mormon, which was based on reading that particular text at least once a year during the years I remained an active, believing Mormon. In addition, I have a pretty good familiarity with the current apologetic arguments defending the ancient origins of the Book of Mormon. I converted to the Mormon church at the age of 19, along with my parents and sisters, graduated from BYU, served a mission, married in the temple, had three children that I proceeded to raise as active, believing Mormons. However, after well over a decade of being an active, devout believer, I began to gradually discover the “other” side of Mormon history, initially through reading Mormon Enigma, Emma Hale Smith. Through the next several years, I obsessively read whatever I could find about early church history, and gradually lost all faith in that religion. 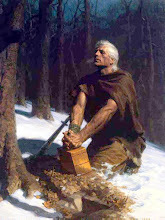 I moved back towards my childhood roots in the Protestant faith, but the skeptical habit I had acquired while analyzing my cherished LDS beliefs was not easily discarded, nor did I want to discard it. The painful, humiliating experience of losing faith in a church I once viewed as “the only true church on the face of the earth” convinced me to remain willing to question my beliefs, no matter how basic. I eventually lost all belief in any godbeing. Today I consider myself an agnostic atheist. I am agnostic in that I do not believe it is possible to know, one way or the other, whether or not any godbeing exists, since that godbeing, by normal definition, exists outside human dimensions or comprehension, and I am atheist in that I lack belief in any godbeing. On a personal level, I obtained a much-needed divorce shortly after leaving the LDS church. My divorce had nothing to do with my loss of faith in the LDS church. I have raised my children outside any faith, and their beliefs vary from vague theism to atheism. They have grown into delightful, intelligent young adults. I have been involved for over ten years with a man I view as my soulmate, although obviously I understand that term in a different way than LDS or other believers would. He is a fellow exmormon atheist, and while we lived most of our lives on separate sides of the American continent, it seems our lives were practically designed to bring us together one day. Losing my faith in the LDS church was one of the most traumatic events of my life, and during that painful process, I was very grateful towards other exmormons who took the time to reach out, through the written word, to share information, experiences, and feelings with me. I desperately needed their community. The effort I have put into making this information about the Book of Mormon and ancient Mesoamerica is my way of repaying that community.